What is your feeling after the announcement of Donald Trump's election? November 9th 1989: the fall of the Berlin Wall. November 9th 2016: the election of Donald Trump. In both cases, the end of the world. Our last Nobel Prize winner in literature, Bob Dylan, finally revealed himself to be a good prophet: The times they are a-changin! In any case it's a historical event that we just witnessed. For decades, the American presidential election has presented itself as a duel with blunted foils between two candidates of the Establishment. This year, for the first time, an anti-Establishment candidate presented himself – and he won. “Despite his exaggerations,” said a journalist. Rather because of them, he should say, as the electorate of Trump could not longer stand political correctness! Actually, in this election, it's not the persona of Trump that is important. It's the Trump phenomenon. A phenomenon which, just like Brexit five months ago, but with an even stronger force, illustrates in a spectacular way the irresistible push of populism in the world. Natacha Polony said it very well: this phenomenon “is only the the expression of a deep movement that encompasses all Western societies: the revolt of the little middle classes destabilized in their identity by the groundswell of globalization that had already carried away the working classes.” The dominant fact, at the moment, stems from the growing defiance that the people manifest towards the position of the political, economic, financial, and media elites. Those who voted for Trump firstly voted against a system of which Hillary Clinton, a fairly decadent symbol of institutionalized corruption, gave an exemplary example. They voted against the “swamp of Washington,” against political correctness, against George Soros and Goldman Sachs, against the morgue of career politicians who sought to confiscate democracy for their profit alone, against the show business that Clinton called to her rescue. It's a wave of anger that revealed itself to be irresistible. Beyond this victory, the difference in votes was considerable. How do you explain it? Is it the last surge of Whites and American Indians, threatened demographically by Blacks and Latinos? In the United States, the popular vote is one thing, that of the grand electors (the “electoral college”) is another. The most extraordinary thing, and the least expected, is that Trump also won the electoral college. Of course, we can assess that he had above all the White working class, from which a certain number of votes had previously gone to Bernie Sanders (in this sense, the vote in his favor is also a class vote). But, however interesting it may be, an analysis of the vote in ethnic terms would be rather reductive. Analyses will surely appear in these upcoming week that will show Trump also obtained votes among Latinos (“Trumpistas”), and even among Blacks. The true divide is elsewhere. It is between those who consider America as a country populated by people who define themselves firstly as Americans, and those who only see it as a political field divided into categories and pressure groups each desirous of having their particular interests prevail to the detriment of others. Hillary Clinton spoke to the second, Trump to the first. The political line of Donald Trump could roughly be described as rather liberal (Translator's note: meaning liberal in the European sense of the term, that is market oriented) internally and rather protectionist externally. Does this sound interesting to you? Is it not this “internal” liberalism that the Front National lacks in order to break out in France? The situation in both countries is not comparable, and the form that populism could (or should) take is not the same. In the United States, the anti-Establishment resentment is inseparable from the idea specific to the Americans that the best government is always that which governs the least. This liberal aspiration to “always less state” is part of the American DNA, but not that of the French who, in today's crisis, demand on the contrary more protection than ever. Contrary to what you said, the Front National, in my opinion, would therefore have every interest in further hardening its critique of neoliberalism. As for supporting liberalism “internally” and protectionism “externally”, that seems rather convoluted to me. There is not on one side a liberalism that says one thing, and another liberalism that says the opposite. By the same token of its founding postulates, liberalism implies both free exchange and free circulation of persons and capital. There are certain exceptions to this rule, but then we leave the liberal game. It is quite clear that with Donald Trump, the United States will not cease to be one of the engines of the capitalist system in which it is the most brutal predator. Although he is not a Wall Street figure, Trump himself corresponds quite well to the image of an unbridled capitalist. The FN congratulates the victory of Donald Trump. The French right seems to have collapsed. Who will reap the benefits here? Probably not too many people, Marine Le Pen was the first (with Putin) to congratulate Trump, and is quite natural. What is rather comic, it's seeing all the politicians, on the right and left, who were loudly rejoicing in advance for Clinton's victory that seemed “evident” to them, tomorrow need to make a good impression with Trump, to welcome him among themselves in international summits, doubtlessly to receive him one day at the Elysée, after having having dumped insults and contempt on him. The ruling class is mirrored by the masters of the media circus. The election of Trump is also “incomprehensible” to them as Brexit last June, the “no” of the French in the referendum of 2005, the rise of the FN, etc could be. It is incomprehensible to them because in order to understand it they would have to question themselves in a suicidal way. That's why they find nothing to do other than recite their mantras about the “discourse of hate,” “demagogy,” and “the incompetent people” where the people are pleased. Their conceptual instruments are obsolete. They do not want to see reality, namely that the people can no longer stand a representative democracy that increasingly represents nothing and an expertocracy that systematically ignores the problems that affect them in their daily lives. Lenin said that revolutions happen when those on the bottom no longer want to be ruled and those on the top no longer can. But the existing elites are incapable of realizing it, even though the soil is giving way under their feet. Listen to them try to “explain” what just happened. See their disheveled, petrified faces. After having declared Clinton the winner until the last minute, they do not want to identify the causes of their errors at any price. These people are incorrigible. Didn't Marine Le Pen, she who speaks of “calmed France” with a very moderate discourse where Donald Trump played the aggressive and determined card, learn a lesson? It's an error to believe that what works well in the particular context of one country will work automatically in another. Trump, the “billionaire clown,” made statements of stunning violence during his campaign that would be unthinkable in France. Determination, furthermore, doesn't necessarily imply aggressiveness. The slogan “calmed France” has justified itself very well a few months ago. It will not have escaped your attention that as electoral deadlines got closer, the leadership of the FN abandoned it. The candidacy of Donald Trump was notably supported by the Alt-Right and an army of young virtual militants who fully utilized video and photographic montages or humorous drawings to support Donald Trump with humor. Is it the end of traditional militancy? Is it the beginning of a new age, that of computerized activism and the use of humor? It is evident that the Internet and social networks henceforth play a decisive role in political life, but the partisans of Trump are not the only ones to have used it. The supporters of Hillary Clinton were not outdone. But if we speak of “computerized activism,” it's above all the revelations of Wikileaks that we must think about. They had, as you know, a decisive role in the American electoral campaign. Beside Donald Trump, the grand victor of this vote is named Julian Assange. What consequences do you expect in Europe? In the World? There is every reason to believe that the consequences will be numerous and considerable, but it is too soon to speculate about it. As much as Hillary Clinton was predictable (with her, war with Russia was nearly assured), the intentions of Donald Trump remain relatively opaque. To deduce what the guiding lines of his policy in the White House will be from his most thunderous campaign declarations would be audacious at least, if not naive. Trump is not an ideologue, but a pragmatist. We must not forget (the parallel between France and the United States can also be mistaken) that the president of the United States, caught between Congress and the Supreme Court, is far from having all the powers that we attribute to him on this side of the Atlantic. Especially since the military industrial complex is still in place. Moreover I think that the European “Trumpists” will not necessarily have good surprises. That Donald Trump in concerned with the interests of his country is completely normal, but it does not follow that it favors or coincides with our interests, “America first,” that also means: Europe far behind! After the decades of all-around interventionism and neocon imperialism, the return to a certain isolationism would be a good thing, but that could also have its downsides. Don't forget that no American government, interventionist or isolationist, has ever been pro-European. Will Trump effect lead to the end of the EU? 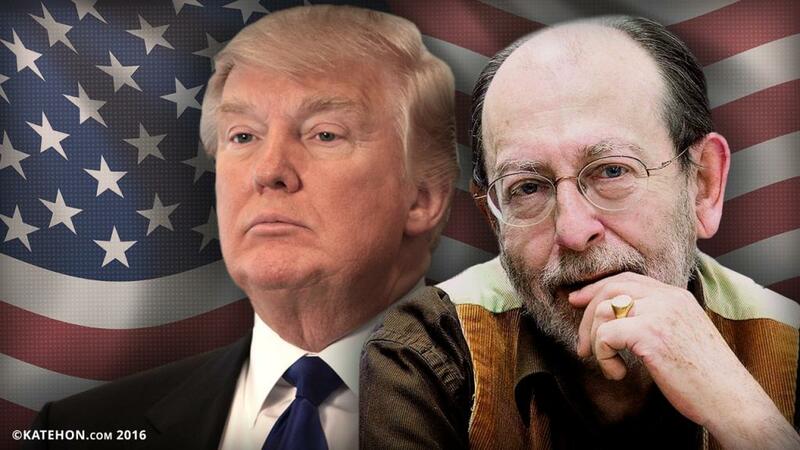 Donald Trump vs. the New World Order? The West lost this mini Cold War with Russia, and the election of Donald Trump is a direct consequence of this result.